Basic metadata describing PARADISEC's collection can be freely and easily searched through OLAC, ANDS or the LINGUIST LIST gateway. Access to the collection and catalogue records is available here: http://catalog.paradisec.org.au. Access to data in the PARADISEC repository is available to those who have clicked the access agreement (see the access form).A nominal fee may be charged for files delivered on CD/DVD. Completed forms should be posted or faxed to PARADISEC (Sydney). PARADISEC has been funded by the Universities of Sydney, Melbourne, New England, ANU the Australian Research Council and Grangenet. View a glossary of acronyms used on this site. To report broken links or for comments on this webpage, email PARADISEC. Please note that the PARADISEC website has been redesigned. We encourage you to include archiving costs in your funding applications. Documentation of small and endangered languages must include the provision for safe longterm storage of the data. The sheer size of the PARADISEC collection and the commitment by the large team of researchers running it makes it a trustworthy repository. But the cost of preparing the data and digitising analogue tapes needs to be recouped from depositors who can afford to pay for it. The following table gives notional costs (in Australian dollars) for processing tapes and digitising their content into a secure repository. Metadata entry conforming to the OLAC Metadata standard is included as a cost, and assumes that the depositor has provided basic information as outlined in the PARADISEC metadata statement. The cost of returning tapes and CDs to the depositor is also included in the table below. These costs are provided for inclusion in funding applications. Quotes can be provided for large jobs. If provided in electronic format as delimited text by depositor $10 per tape. If provided on paper (e.g. on tape boxes) $30 per tape. If a downsampled CD copy of the digital files is required this can be provided at a cost of $5 per CD. Textual track reading is an additional cost. We offer a service of safely housing data which is not accessioned into the collection, especially work in progress or data that is not for general distribution. 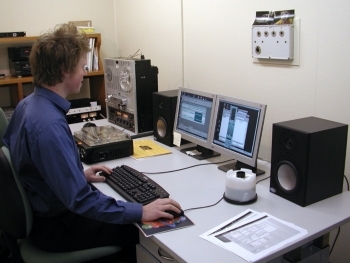 To find out more or to enquire about our fees for digitisation and CD production, please email us. Mould-affected reel-to-reel tapes await processing in PARADISEC's Sydney lab. 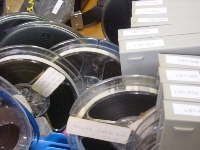 It can take several weeks to prepare such tapes for digital transfer.